On Monday, a New Zealand family were just walking along a Northern Auckland beach when they stumbled across a bizarre, pink-colour blob that resembled a volcano shape. The creature, which turned out to be a species of huge jellyfish, has a white segmented outer body, with a colourful red inside, and looks just a bit like a really squishy alien. "[Jellyfish] were everywhere and we were pretty amazed. Then we saw this massive one that seemed different from all of the others," Eve Dickinson explained to Auckland Now. "We spent ages looking at it because of its beautiful colours and shape. My boy said it reminded him of a volcano." What the Dickinsons had come across on the Pakiri Beach was a lion's mane jellyfish (Cyanea capillata). Underneath its mushroom top, there's a number of thin strands making up the jelly's tentacles. But when it's washed up on a beach, the flattened shape makes it look rather like some alien creature from a low budget sci-fi series. And the family saw it make pulsating movements, too. "It almost looked like a load of muscles contracting," Eve's husband Adam told Yahoo7. Lion's mane is actually the largest known species of jellyfish, and has been found all over the world, from the Arctic to Australia and New Zealand. They are normally around 50 centimetres (20 inches) wide, but the largest ever discovered is thought to have washed up on Massachusetts Bay in 1870. It had a massive 2.3 metre (7.5 foot) diameter. Marine biology technician Diana Macpherson from the National Institute of Water and Atmospheric Research in New Zealand, says that these guys are pretty common around the islands, but not so close to the end of winter. "They're usually around during the spring and summer because the plankton starts to bloom, so as a result they come around too," Macpherson said. "They've got all of these fishing lures out there at the same time," says Lisa-Ann Gershwin, a marine biologist with Australia's Commonwealth Scientific and Industrial Research Organisation, in an interview with Wired back in 2014. "Every single tentacle is out there to catch something. They can find so much food simply by multitasking, really." 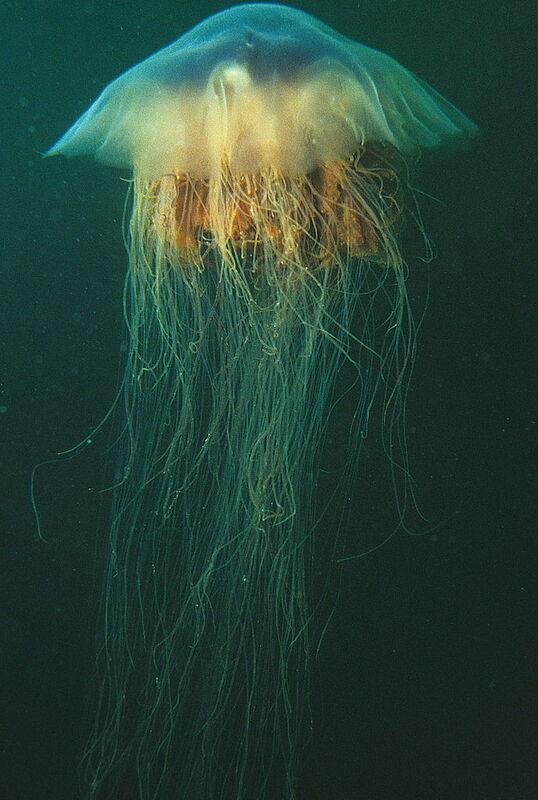 Amongst the things lion's mane jellyfish enjoy eating are plankton and other jellyfish; as they float around the ocean, reeling in food with their stinging tentacles, they also act as an oasis for small fish and shrimp immune to its toxins. These creatures feed off the jellyfish's leftovers. In turn, the lion's mane jellyfish is eaten by other large fish and sea turtles; for example, leatherback turtles subsist only on jellyfish. As the temperatures change due to climate change, these enigmatic creatures might start showing up in weird times of the year more regularly. But if you do see any lion's mane jellyfish on your local beach, we recommend not touching them. Although their stingers are not going to cause serious damage, they can still cause some pain. "They have a toxin in their tentacles which can hurt you if you get too close to them," says Macpherson.